There is something very mystical about jade, the stone is mined in many places across the earth. The term 'jade' encompasses two stones - nephrite and jadeite. The only commercial mining operation for jadeite is done in Myanmar (Burma). 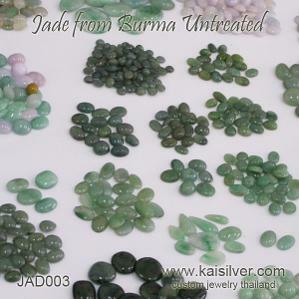 Jadeite is the preferred type of jade, given the volatile political landscape in Burma, trading in this gemstone is controlled by a handful of international entities. The Kaisilver jade pendant is set with a natural jadeite gemstone from Burma. You can let us know if you prefer to have a nephrite jade set in your custom jade pendant. Some of you might not be aware that jadeite one of the two varieties of jade, can match the per carat price of a diamond. So how do we manage to price the PG3001 jade pendant, so modestly. To answer this question, it would be necessary to understand a few important facts. Jadeite is generally found in large boulders of rock. A small portion of these gems have a rich green color naturally. Gem cutting operators, dye the remaining jadeite to give it an attractive color. There is nothing wrong with selling or buying dyed jadeite but, things are not so simple. Gemstone sellers are known to sell the stone, without disclosing that it is dyed. 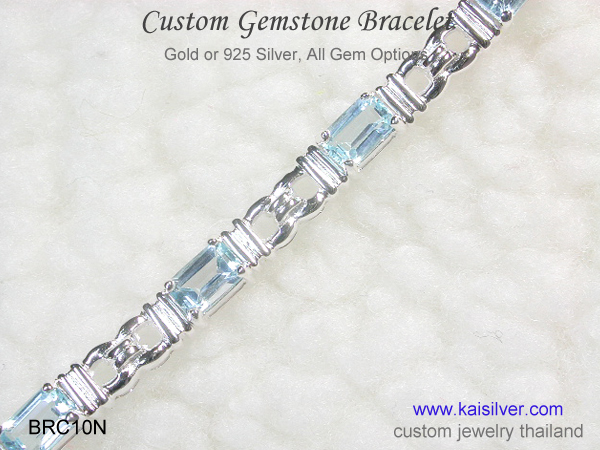 Most of you would be aware that Kaisilver, sources gemstones directly from miners across the globe. When it comes to jadeite, our gem procurers locate themselves close to the mining operations in the Kachin state of Burma. They are basically told to hunt jadeite pieces that are not very expensive and yet, offer good value at their price points. When such a piece is located, the deal is struck right near the mining pit. We take possession of the boulders (with jadeite embedded) and ensure that the stones are not treated in any way. Every PG3001 custom jade pendant is set with an untreated jadeite gem. Each piece is cut and polished by our skilled cutters in Thailand. And what if you wish to have a high quality jade for your gold or 925 silver pendant. This is something that can be easily handled, most miners in the jade mines allow us to make first selection of their inventories. 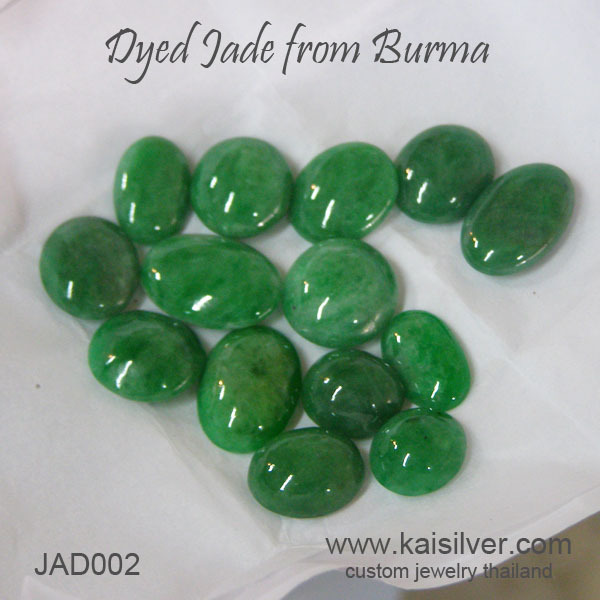 Let us know if you need high quality jade stone for your pendant, we will procure the gem and custom cut it. We will also get the gem certified for authenticity by an independent gem testing lab. 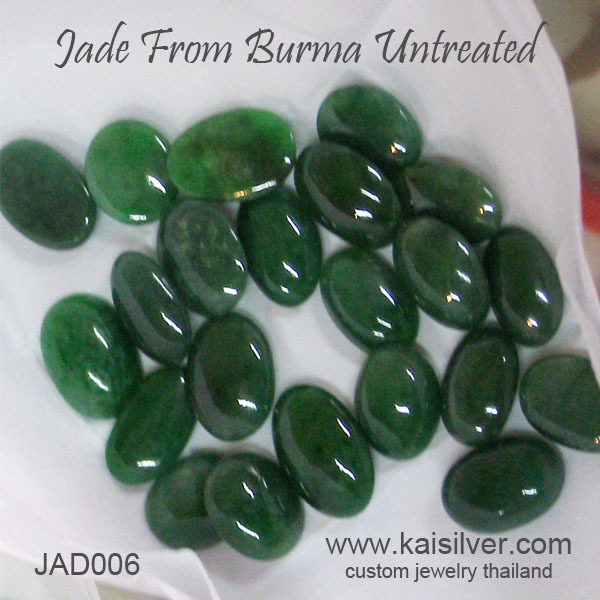 The gemstone is a natural 14x10mm oval untreated green jade gemstone. We provide all gem options for this gold or 925 silver pendant. 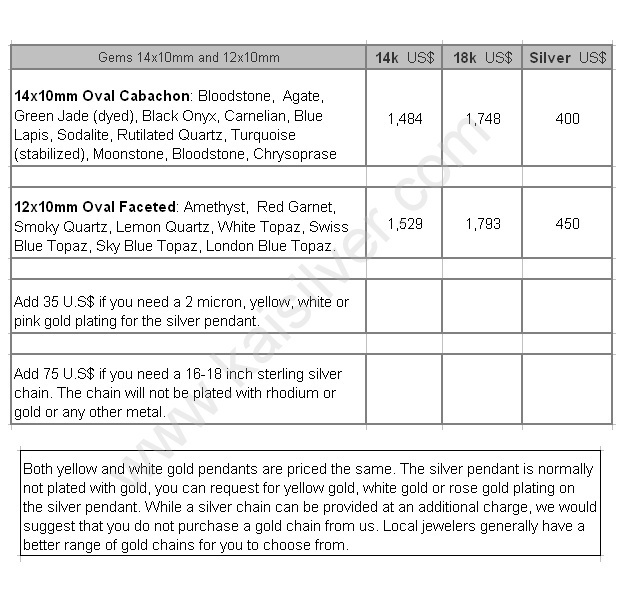 As seen in the price table, some of the gem options provide a 12x10mm gem. The silver and gold jade pendant is crafted to the same quality standards. The gold pendant is available in 14k/18k yellow, white or pink gold. The metal weight for the sterling silver jade pendant is 10 to 12 grams. The jade pendant in 14k or 18k gold has a metal weight of 12 to 15 grams. The total length of the pendant including the loop for the chain, is 3.5cm to 4cm. All design modification requests can be accommodated, this includes gem shape. We can custom make a pendant for you with your own design idea. Let us know if you prefer the back of the stone to touch the skin. 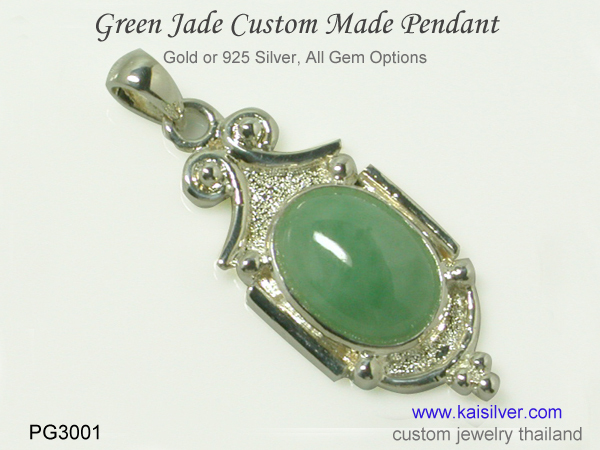 Buying From Kaisilver: If you are interested in this jade gemstone pendant or any other jewel from Kaisilver, do not be in a hurry to purchase and pay. Discuss your requirements with the team at sales@kaisilver.com , we will provide you with suggestions and advice. We can custom make a pendant or any other jewel with your own design. Being networked to all the gem mining locations across the globe, we let you choose the gemstone of your choice without any limitation. 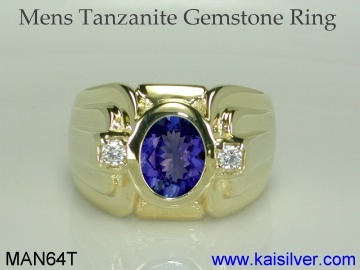 A silver or gold gemstone pendant, is made to the same superior quality standards. There is a lead time of 4 to 6 weeks for production, this from the date of payment confirmation. Shipping is done through FEDEX, you will be provided with a tracking number the moment the order ships. While Paypal is our preferred mode of payment, we can also accept Western Union Transfers. Let us know the payment mode that suits you the best, we will provide details for the same.